Just a quick update, I've been catching up on all the Project Catwalk's that I've missed - focusing on the first series as it's far better. Anyway, it is the weekend before I go to Paris and I am thinking about my suitcase and what to put in it. Autumn/winter styling is here and this is my favourite time to go shopping. Summer shopping is generally hot, there are crowds of people with body odour and attitude but to top it off the clothes are more often than not a little dull. Now there is a chill in the air, the shop windows look appealing, people are happy to get in the warmth of the shops and the clothes are far more interesting and varied. The weekend has seen me visit COS on Regent Street and be suitably impressed. I've been looking for the right black jeans for some time, wanting something I can wear most days and in different environments but still look right and I found the pair for me, all for £40! To top it off I bought a black and grey plaid shirt and a skinny grey belt. All in all i got the makings of a great outfit for under £100. Great, affordable style! From here I went into Swear on Carnaby Street and was undecided about a pair of shoes which were almost exactly what I wanted but not quite...It was just the pointed toe and the detail that was not quite right. 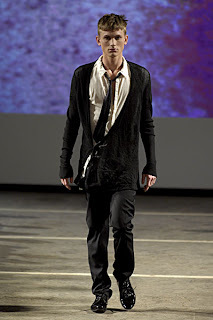 Here is Bailey (during the a/w 07 collection) playing with menswear proportions, mixing outwewear with knitwear so well. 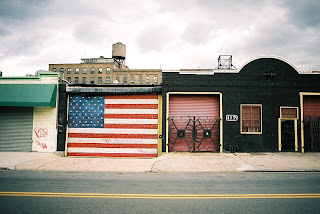 As you are off to the US I thought I thought I would whet your appetite for everything stars and stripes. What better symbol of everything that is good about our American cousins than James Franco? Here he is on the cover of Vogue Hommes International. I've not bought it yet but this cover is so much better than the previous one which had Pete Doherty gracing it! Thanks to Fashion Verbatim form making me aware of the new issue. Not so sure that he is the new James Dean, I think he will be around for a lot longer! He certainly looks good in his leather jacket and his damn cool! I REALLY want a leather jacket and think I'll treat myself to one before Christmas! Anyway, enough of this you have a plane to catch! Have fun and buy me presents! OK, I admit that I have already bought two items other than the five above; a thin, black patent belt and a pair of fingerless gloves (like the squirrel collects nuts, I am collecting my winter accessories!) which demonstrates my change of heart when it comes to Topman. I have been a little harsh on the store, I just had a few bad experiences within those walls and it put me off..until now. 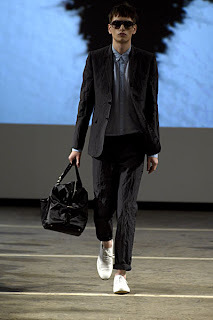 I have to talk about MAN, which has had a couple of good shows of late and has helped me trust Topman again. 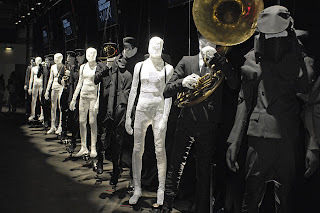 For me this show was all about Aitor Throup, who I Love because he is one of the few designers emerging who amazes me, not just within his clothes but everything he does. I will revisit Mr Throup's work in the next week. His contribution to this show was more of a presentation and one I wish I could have seen live! 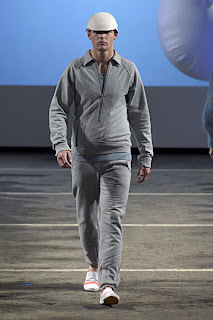 British menswear Designer of Year Kim Jones unveiled his KJ by Kim Jones line, which was fine but not really for me. Plus as you can see from below the models put me off! Seriously? This guy looks like a power walker who needs the walk! 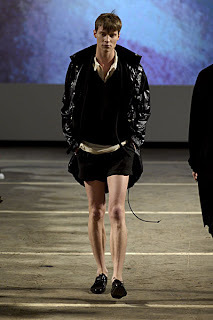 Topman Design as they probably should have revelled in the show lights and I fell in love again. Aside from the short shorts I really like this! 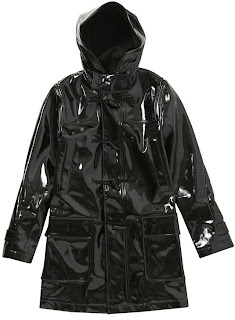 The PVC jacket looks awesome! Cool spring/summer dress wearing. I think I've found my casual summer suit. I'm not normally a fan of creased clothes but it looks great on the catwalk and I'm interest to see how well it would translate in the real world. The bag looks great aswell! My faith in Topman has been restored. A combination of family visits (sans internet, shock!) and general malaise have stopped me posting of late I'm afraid. 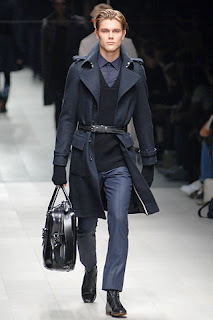 I had a major headache today, not helped by thinking far too much about this coat from Topman Design. My thoughts, as always, on important matters I'm sure you'll agree. Scarves- I'm definitely going to elaborate on this one at a later date. I don't know about London, but Manchester is COLD today. This has let to me wanting to wrap up even more than usual. This gorgeous multi-coloured scarf by Paul Smith (aka designer I adore right now) is just brill and would be the perfect way to liven up a subdued outfit. A cheaper alternative can be found here for those of you who paid heed to my earlier call to needles. Do let us know if you give it a go! Blogs I don't understand- not because I'm thick, just because I don't read the language. I found Breach of Style through another blog (I've forgotten which one) and spent a good 10 minutes (which is a lot of time given the headache I'm carrying around today) admiring knitwear and coats and thinking that maybe the 6 or 7 coats I already own isn't REALLY that excessive and that I could probably use 3 or 4 more. It has been a lazy Sunday, it started off being as Lionel once say an "easy like Sunday morning" as I was treated to my weekly does of television. I watched Friends and I was inspired by the episode. Joey was auditioning for a 'sophisticated' part in a play, so Rachel offered to help him look the part. She outfits him at Bloomingdales, and part of the ensemble is a "man's bag," which bears a striking resemblance to a purse. Unfortunately, Joey's devotion to the bag ends up costing him the audition...All in all the episode did put the man bag on the map (well TV) but it was not received well. 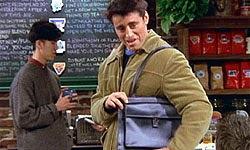 The episode featured a series of running jokes about Joey falling for a unisex handbag that resembles a purse. Not only is Joey's bag mocked by Ross and Chandler but, fatally for manbags, the moral of the story is: carry a bag and you will not get the job. However, this show was aired in 1999, things have changed or if they haven't and I'm just weird, well I'm happy to be so. In a world where I frequently carry lots of gadgets, magazines, books, keys and money rather than bulk out my pockets or ruin my suit trousers, the man bag in its various guises and sizes is a necessity. You can see that I like this style of bag right now! 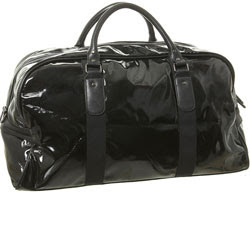 Topman Design - Black PVC holdall at only £50 - I like! 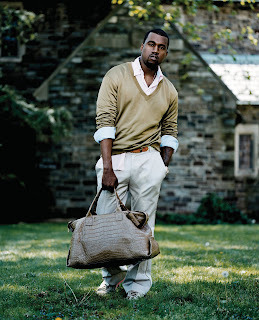 As we talked about following rules I will leave you with some insight on how to choose your Manbag by GQ's Cahrlie Porter and my responses to most of them. 3) Think about the weight of the bag. If the leather is thick and heavy, then, when the bag is full of stuff, it will be too much of a burden. 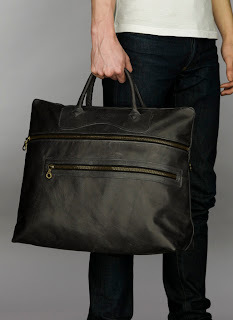 Men’s bags are normally bigger, but this doesn’t mean they should be impractical. 4) Look in unusual places. Fishermen’s bags by Brady are a current sleeper hit. They can be bought at Labour and Wait on Cheshire Street in London, while Topman has done a cheaper version in vivid colours for the summer. 5) Explore the unusual. Pochettes are returning this coming season, especially at Prada, where they have the appearance of an exercise book for a back-to-school look. 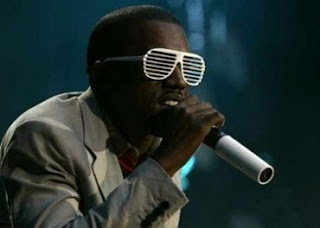 Apparently Kanye had designs on specific Jeremy Scott shades to wear in one of his performance scenes for the 'Stronger' video — and it took him three months to find them, finally spying a pair in Paris. ("I wanted something you can't get in stores," he explained.) Personally, I like them on Mr West but they aren't for me. What do you think of Mr West? Have you heard DJ A-Trak's remix of Stronger? Here it is. I like Kanye, but oh what an angry man he is in that video clip. Britney I just feel sorry for... poor lass, she clearly wasn't ready for that. I'm not sure about the first pic. The clothes certainly look sharp- the very low v neck makes it that bit more interesting, as does the way the sleeves are rolled up.- am I imagining it or are they a different colour to the collar? 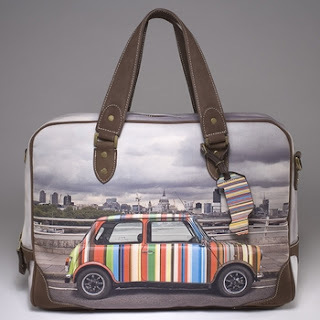 Really like that back too- I keep going to Selfridges and stroking very similar bags. They haven't thrown me out yet though. I adore the sunglasses. The man seriously knows how to pick interesting stand-out pieces (and he shares my not-so-hidden love of cardigan jackets). I love how he's not ashamed to be seen/filmed in the same item of clothing more than once. I saw an interview recently where he defended this, saying quite reasonably that when he likes something he wants to wear it all the time. I certainly know how that feels! By the way, have you seen the Bape/Kayne West trainers? Much to Steve's jealousy, 2 weeks today I am off to America! I will be visiting Boston and New York. This does mean that there will be a couple of weeks where I won't be posting (I'm just not that dedicated... I haven't been in an internet cafe for about 5 years now), but I'm sure the blog will thrive in Steve's capable hands. Hopefully when I get back I will be bursting with ideas, not to mention awash with photos as I'm planning on buying a camera (hurray for the exchange rate!). While shopping won't quite be at the uppermost in my priorities list, I welcome any suggestions of places I just shouldn't miss. Thank goodness we are finally in the season of new magazines. On today's visit to Borders I bought and fell in love with 10 plus. 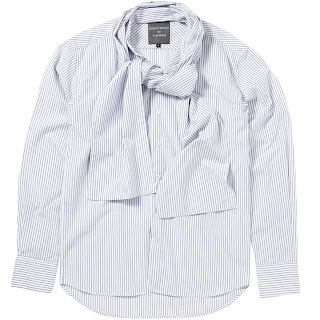 It's aspirational men's fashion but isn't done in the normal way. 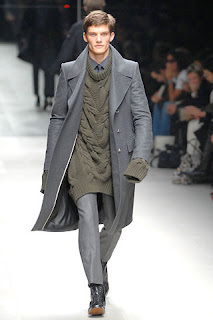 I have finally found some great fashion writing when it comes to covering men! The highlight thus far is Richard Gray's assault on fashion victims which made me laugh out loud a few times on the 134 bus home and consequentially a few stares from my fellow suitably glum commuters. He mentions both The Face and Depeche Mode on the very same page, I think I am in love. I will give you a quick round up of his top ten victims but will return to them and will both expand and illustrate them as soon as i get the chance. Most men's (and women's) magazines seem to like trotting out 'rules for the stylish man/woman' or some such nonsense at least once a year it seems. It's a strange idea when you think about it to assume that all 'stylish' people abide by one set of rules, and not really a myth I buy into. More often than not these lists vary from the vague to the oddly specific. Take this lot from Esquire.com: Tom Ford's Style Rules. The first one- 'be confident'- seems like fairly sensible advice but 'never button more than one button on a jacket'? What, never? Seems very odd to me and not something I would necessarily advise or entirely see the logic behind. Surely most jackets are designed to look their best properly buttoned up? Maybe it's a slimming thing. "For all hairstyling products, a little dab will, indeed, do you. In the unlikely event that a little dab will not do you, get a different hairstyle." Good advice, perhaps, for the men who do overuse, but for the quiffed man? Pah! So what do we think about rules? Personally I'm inclined to think 'learn them, know them, then make up your own'. That way at least if someone says you look crap at least YOU know what you were aiming for. My own personal rules focus on flattery. and remember that accessories make all the difference. What do you think? What rules (if any) do you follow? I try not to follow rules but I do know a vast number of them. I used to love reading the ask GQ style questions, it was the highlight of the magazine for me but it did put me off. It reminds me of American Psycho, when an outfit is thought about so much it is no longer style, it's more of a maths equation as opposed to something aesthetic. That said I do try and match my belt with my shoes and aim to match my bag with the rest of the look. I am not a fan of Tom Ford and wouldn't take too much notice of man who applies the same rule of never buttoning up more than one suit button to that of his shirt buttons (a slight exaggeration but seriously Tom I don't want to see your chest hair!) Whilst I'm on the subject of your style Mr Ford, please take note that you can wear more than just white shirts (unbuttoned) with a suit jacket and jeans! OK, enough of this nonsense. I agree with Ford on his first rule of 'be confident', if you wear your clothes confidently most things will look good. I partially agree with one his other rules 'You can't wear trendy clothes forever. Everyone has to grow up.' It is sad fact of life that we all do get older, although in most cases men look better with age. I advocate that your style should develop with age but growing a few years older should not necessarily mean you can't wear certain things. Is their an age where it is no longer acceptable to wear jeans or trainers? I hope not anyway. I think there comes a time when you can't wear jeans and trainers as your staple uniform but this age should be quite young. Everyone should mix it up when they have the chance! On the flip side (did I just say flip-side? that's a first right there) of this point I don't think age is an excuse for bad clothes. Just to counter all of the colour we have been featuring lately, lets go in the monochrome world of Joy Division (as I'm getting excited about the film). They are one of our favourite bands and I have been waiting for this film for some time! Upon hearing the gossip that Jude Law was touted as playing Ian Curtis I must admit that I was a little worried but after seeing the recent stills I am excited once more. The film is directed by Corbijn who is renowned as a photographer and image-maker to great bands like Depeche Mode and U2, but let's not forget Travis...and according to reviews Corbijn acquits himself well. According to Stephen Dalton for Times Online "He and his cinematographer Martin Ruhe frame Control in stark monochrome, a bold but appropriate choice, complementing both the angular modernism of Joy Division’s music and the northern social-realist tradition echoed in the film’s austere style." Even if there is no substance it seems that style wins out. 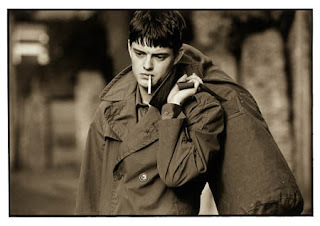 The film 'Control' is a profile of Ian Curtis (played by Sam Riley...who looks remarkably similar). For those of you who don't know (but damn it you really should, have you no taste!?) 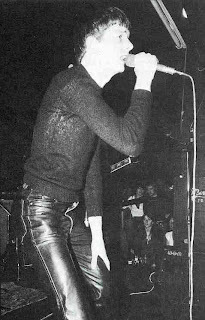 Curtis was the enigmatic singer of Joy Division whose troubles led him to commit suicide at the age of 23 (which is my age). I recently bought a photo book of a Joy Division gig and loved the style on the pages (this is now with EJ as it was a present for her). I'm not sure exactly what it is about them, they certainly aren't unique...I just think the fit and how they are worn just really works (or maybe I am seeing them through rose tinted specs) with the image of the band. Now you can help me out, is it the flash or are these jeans very Dior-esque? Either way I like them. 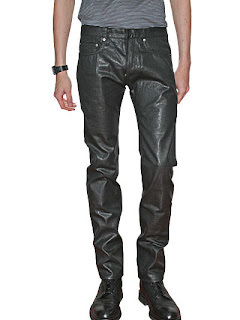 I will leave you with an image of the jeans I am referring to and let me know your thoughts. I have got a feeling that I have been seduced by all of the monochrome here. My next post will return to some colour. Joy Division are a wonderful and much-imitated group (never so much as by Interpol a couple of years back!). Pictures from the photo book can be found here. I'm (well, Rob is) lucky enough to have a vinyl recording of that gig too. I think what is so resonant about their look is that it just goes so well with the music they made. It has a sincerity about it, a sincerity that you find in their entire body of work. Can't wait for the film. Well what can I say to that? Truely remarkable. The reactions from the other customers are just great. Just one question though? Am I missing something or did that newly created teddy boy walk out with that quiff creating device still in his hair? Surely not. . I have been doing it all wrong and definitely need some help so I want a quiff creating device for Christmas or failing that my own barber who posseses those skills. After not being able to get my fix from the sartorialist and facehunter I am now in overdrive and my thirst for treats for the eyes is hard to quench. To be honest I've not missed too much in the last few days (although Ivan's recent posts on new York have confirmed my desire, no scrap that, NEED to go!). I've also been advised to visit misshapes which thus far I've neglected, well frankly because of my own ignorance but have enjoyed wasting the last couple of hours spotting celebs and scensters alike! All of these sites keep me out of trouble. Anyway...there was a point to all of this. That point was thus; to extend on your discussion of colour and men's apparent lack of balls to try it. I completely agree and I am guilty of it but this autumn/winter I will experiment and be a little more adventurous. That said, classics do work but classics don't necessarily have to equate to monochrome. This guy looks awesome in the classic Lacoste colour combination of pale pink and apple green. He has a certain Kanye meets Andre 3000 thing going on and in my book that's not bad at all! I love his use of accessories, both his sunglasses which and his bad, I am a big fan of totes at the moment (they are so practical! )...The moral of this post is you can use colour and it doesn't automatically mean unusual experimentation but there is certainly more out there than just monochrome. I all-out love this guy (and love that our posts now have morals!). I think the trick to pulling this look off without looking like you're trying to hard is to keep it relaxed. Skinny jeans nd trousers are ok but here you wouldn't want these trousers any narrower than they are: the colour and the cut should not be competing for attention in such a bold look. This is the second photo I've seen in a little while with a half-tucked shirt like that (one of the blokes in the plaid post being another)- is this some trend I'm missing out on or just people being snapped before they're ready? I somehow think it's more likely to be the former. 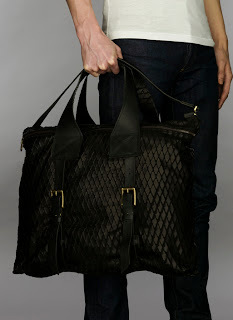 We seem to be out of sync with bags though- I don't like this one that much (plus it looks a little tatty). Maybe because it looks a little drab compared to the rest of the outfit. Want those shoes badly though. Funny you should mention Andre 3000 too- I have been rekindling my love of Outkast recently. It's amazing how much 'So fresh, So clean' makes me want to dress up in my maddest, coolest outfit and dance around the house.